There are many types of sensors onboard Earth observation satellites. Spaceborne remote sensing instruments are broadly categorized according to the observation techniques they employ and the electromagnetic spectrums in which they operate (optical or microwave). Utilizing comprehensive design engineering JAXA has acquired and accumulated for a sensor system, we have been researching key technologies and sensor systems expected to be required in the next decade or two. We have also been working with internal and external organizations to devise space missions that can fully benefit from the remote sensors to be developed in the future. An ultimate goal is to translate our research findings into Operational Earth observation missions. Observations of the Earth with spaceborne sensors are becoming more essential for everyday activities on the planet. 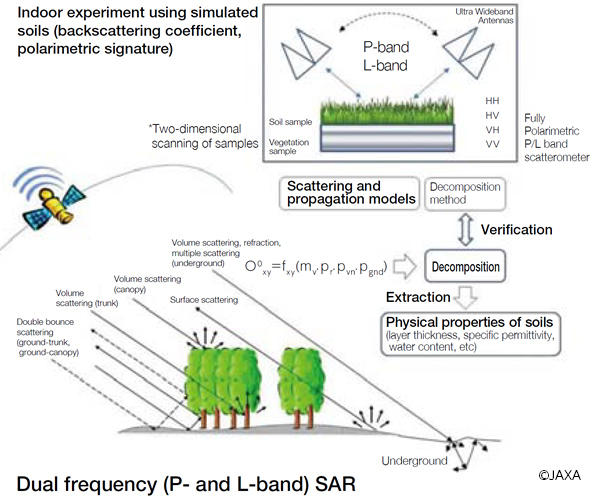 Remote sensing satellites use the Sun or their own electromagnetic radiation sources to quantify and record the energy reflected back from Earth's surface. We have been researching a sensor system made up of various advanced technologies and the most appropriate satellite constellations with which to capture reflected energy in a wider electromagnetic spectrum and obtain higher precise images, spectrally and spatially. The sensor systems will provide many benefits to the public by capturing information on the atmosphere, oceans, and landmasses. These data will play a vital role in solving natural disasters and global challenges such as climate change and abnormal weather while benefitting people's daily lives and industrial productivity. We have been researching a promising new array of sensor systems called the Light Detection and Ranging (LiDAR) systems. Japan has few experience in developing spaceborne active optical sensors, but it is expected to be strong technologies for measuring the vertical or three-dimensional distribution of target objects with high-resolution. We have been researching a larger telescope system capable of obtaining higher-resolution images from Geostationary Orbit (GEO). We have been researching radars that will use a multi-beam technology for wide-swath coverage, and measure multiple frequencies all at once. Also we are expanding the observation band to lower and higher frequencies (submillimeter-terahertz wavelengths) across the electromagnetic spectrum for both active and passive sensors. We have been exploring future sensor systems by researching advanced technologies such as a high-output pulse laser transmitter, Type II superlattices infrared sensor *, non-cooled infrared sensor, large telescope or antenna system, and metamaterials expected to emerge as novel sensor platforms. *Type II superlattice infrared sensor: a novel infrared sensor consisting of alternating layers of InAs and GaSb. The sensor is expected to exhibit good parameters such as high sensitivity and high operating temperatures comparable to those of the current HgCdTe technology.